Attend a Joyful Bear presentation or picnic! What is The Joyful Bear? Would you like to read a sample from The Joyful Bear? Here’s the introduction: Why we wrote this book. VERO BEACH, FLORIDA. Margaret Meps Schulte’s new adult nonfiction book, The Joyful Bear, is intended as a concise nightstand resource, with suggestions for everything from overcoming insomnia and anxiety disorder to becoming a better listener. Featuring an unusual co-author, a stuffed polar bear named Frankie, the book’s unusual premise and pen-and-ink illustrations will bring joy to readers from all backgrounds. 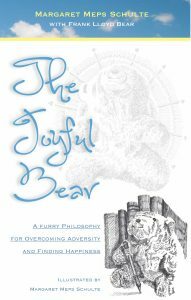 The Joyful Bear incorporates wisdom from such diverse sources as the Dalai Lama, Marshall Rosenberg, and Pollyanna. This human-bear collaboration will take its place beside The Taoh of Pooh and The Little Prince as a valuable guide to overcoming adversity and finding happiness. About the authors: Margaret Meps Schulte is the 2014 winner of the Bookseller Diagram Prize for Strangers Have the Best Candy. The U.S. expert on how to talk to strangers and make the most from chance encounters, she finds Happy Spots wherever she goes and often marks them for others. At ten inches tall, Frank Lloyd Bear is small for a philosopher, but large by teddy bear standards. He has traveled the back roads of the U.S. and Canada and has sailed thousands of miles aboard sailboats. The Joyful Bear is his first book.